Purification A combination of Protein G affinity chromatography and other conventional chromatographical methods. Bioactivity Encephalomyocarditis Virus (EMCV) was used to challenge A549 cells which were incubated with a constant concentration of the antibody mixture and the titrated interferon. 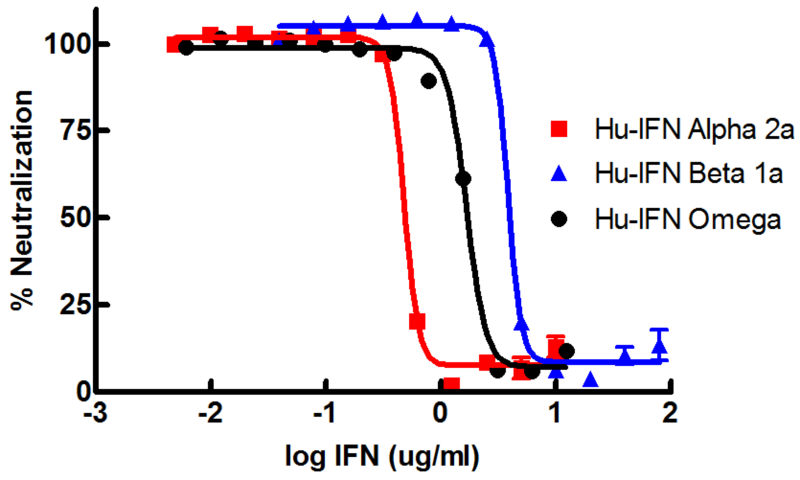 Representative neutralization curves of Human Type I IFN Neutralizing Antibody Mixture (Catalog No. 39000) (diluted 1:50) to human interferon alpha, beta, and omega. In this assay, A549 cells (human lung carcinoma) were incubated with the antibody mixture and titrated interferon, followed by challenging with encephalomyocarditis virus (EMCV).